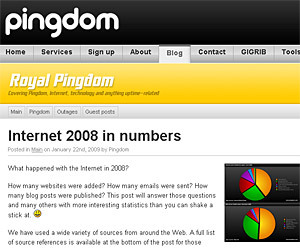 Over 210 billion emails were sent every single day in 2008, according to recent research by the Web site performance business firm Pingdom. The company with the funny name estimated that steenkin’ spam accounted for 70 per cent of all email sent, with the total spam count for the year being an almost unfathomable 53.8 trillion emails. 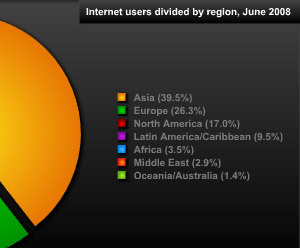 Out of the worldwide total of 1.4 billion Internet users, Asia has the largest share with an estimated 578 million Internet users, followed by Europe with 384 million and North America in third place with 248 million users. The total number of websites on the Internet at the end of last year was recorded at a staggering 186,727,854, with around 31.5 million new websites being added during 2008. Blogging remains hugely popular with 133 million blogs notching up more 900,000 new posts every day, making a total of 329 million posts over 2008. Facebook has more photos than any other website with more than 10 billion photos posted on the social networking website, with photo sharing sites Photobucket and Flickr managing around 6.2bn and 3bn respectively.